Zimbabwe’s president Emmerson Mnangagwa has declared Monday’s accident that claimed 13 lives in Wedza a state of disaster so that government assistance can be made available. 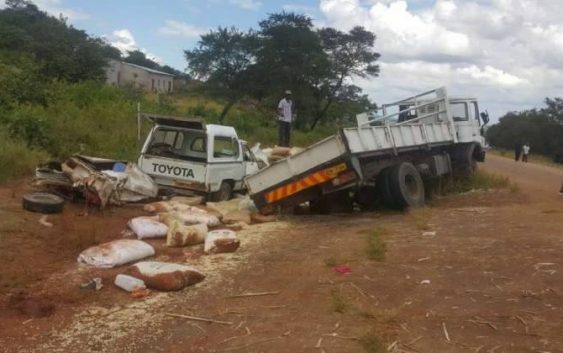 Yesterday, 13 people at Mugodhi shrine in Hwedza along the Hwedza-Mutiweshiri Road yesterday morning were killed after a truck carrying maize veered off the road and ran over the group pf worshippers waiting for transport on the roadside. Six people, died on the spot and seven died on arrival at Mount St Mary’s Mission Hospital. This was a shocking accident where thousands of Mugodhi church worshipers were gathered in Chitope area for their Passover. POLICE have identified 11 of the 13 victims who died at Mugodhi Apostolic Shrine as Paul Mupombwa, Tabeth Mupombwa, Edina Chinoda, Elite Shambamuto, Egenia Mutema, Elisha Mabaira and Josephine Kwaramba, all from Chief Nyashanu area in Buhera. Also from the same area are Mufare Makuwe, and Alice Majokota as well as Patricia Garwe from Wedza.